Disaster-proof, environmentally friendly housing solutions for a changing climate. How can we adequately provide housing when disaster strikes, whether that disaster is weather related, like hurricanes, floods, and droughts, happens in a matter of minutes from an earthquake or tsunami, through a slow process like rising sea levels, or is the result of civil disorder or poverty? There is an urgent need for safe, sustainable housing designs that are cheap to build, environmentally friendly, and hardy enough to withstand severe environmental conditions. Not only is there climate change to contend with, but there are millions of people, right now, who do not have safe or adequate housing. 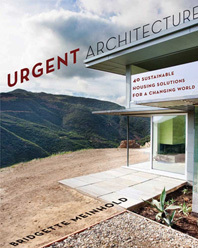 In Urgent Architecture Bridgette Meinhold showcases 40 successful emergency and long-term housing projects—from repurposed shipping containers to sandbag homes. She surveys successful structures as well as highlighting promising projects that are still being developed. Every one is quickly deployable, affordable, and sustainable. This book is an essential resource for those who are interested in green building, sustainable design, eco-friendly materials, affordable housing, material reuse, and humanitarian relief.